While these designations are not cut and dry—open data programs can also value the idea of community members using data to create their own information or interaction—there are dominant values that are both implicitly and explicitly embedded into cutting edge uses of ICTs. 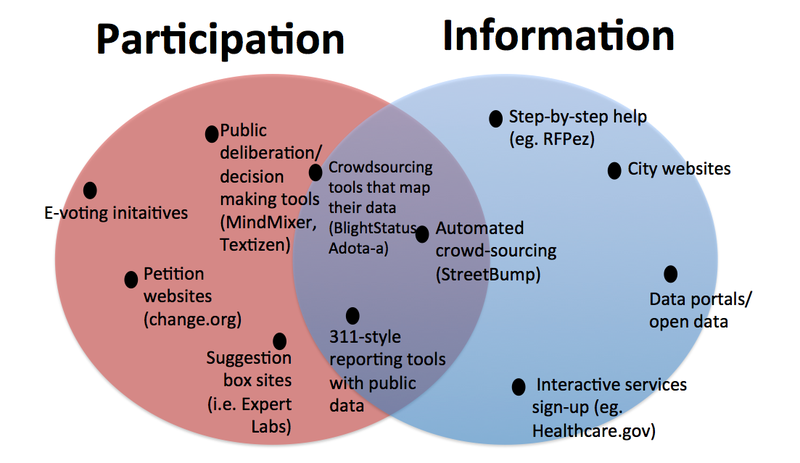 Although these projects share broad goals of improving governance, information-related goals differ from those that are participation-focused. On the participatory end, tools embody ideals similar to those of “strong democracy,” moving away from “thin” forms of participation that leave citizens on the periphery of their own governance, and bringing citizens back into actively engaging in the policy-making process. On the information side of things, however, we see different norms. By focusing on using ICTs s a way to make information more available and navigable, initiatives and tools that focus on open data and transparency highlight citizens’ primary role as one of becoming and maintaining an informed status. As a result, the normative vision of citizenship that such efforts project is one that is focused on becoming and/or maintaining an informed status. While I tend to focus on how to move from the right side of this continuum to the left, simply beginning to chart tools in such a manner can illuminate the normative implications of the current civic landscape and raise questions about where we want to be.